Phobia is defined as a strong and irrational fear of some object or certain situation. The word phobia is driven from the green language where Phobos means fear or more precisely “morbid fear”. People suffering from particular phobias will tend to avoid the situation or object that causes distress. Normally, the fear is a basic survival mechanism occurring in response to a specific stimulus, such as pain or the threat of danger. However, the irrational and excessive fear may be extremely disabling and severely interfere with an individual’s social and occupational activities. Science recognizes many different phobias and here is a short overview of some of the most frequent among them. This phobia is also known as arachenophobia and it describes the fear of spiders and other arachnids. Arachnids are a group of long-legged insects that also includes scorpions, harvestmen, ticks, mites and Solifugae. People with arachnophobia usually feel very upset, even if they only see a spider’s web. It is estimated that about 55% of females and 18% of males in the Western world suffers from this phobia. This notion describes an irrational fear of heights. It is a space and motion discomfort that causes an onset of panic attack in individual in a high place. 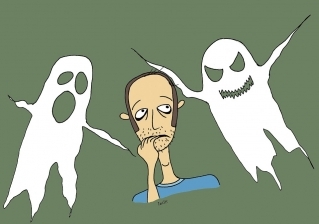 It is estimated that between 2 and 5 percent of all people suffers from this phobia. Scientists believe this phobia is caused by conditioning or a traumatic experience involving heights. Necrophobia is described as an irrational fear of dead things and items associated with death. People suffering from this type of phobia will feel extreme discomfort in the presence of tombstones, coffins, or other objects that may remind them of death and dying. Claustrophobia is a fear of small spaces or rooms. The unpleasant feeling is here triggered by the sensation of having no escape and being closed in the narrow space. Claustrophobia is classified as an anxiety disorder, and it often results in panic attack. The fear is usually experienced in elevators, windowless rooms or even tight-necked clothing. According to the statistics, somewhere between 5 and 7 percent of world population suffers from this phobia. More common name for this phobia is the fear of flying. People affected with pteromechanophobia feel extreme fear of being on an airplane or other flying vehicle while it is in flight. This phobia may sometimes by the combination of one or more other phobias such as claustrophobia or acrophobia. Fear of flying can be extremely unpleasant as it may prevent the individual from going on vacations or taking business-related travels. Aerophobia: Are you afraid of flying? How many phobias are there? How to treat social phobia? I developed another phobia, help me!!!! How/what do you feel when it starts?